Are you ready for the main course? I'm not done with my Thanksgiving series quite yet but I know that people are starting to research how they want to cook their bird this year so I thought I better get this out there. Last year, I researched a lot about cooking turkey and I ended up merging three different recipes and methods from some of my favorite people; Alton Brown, Martha Stewart and Bobby Flay. I'm sure if they ever got in a room together they would have come up with this on their own, but I went ahead and did it for them anyway. The end result is a turkey that's brined and then cooked with an herb rub that not only flavors the meat but makes some of the best gravy I have ever had. I've made it three times now and each time it's juicy and flavorful and just different enough to be fun and give people something different to try. In a cooler or large pot, ( I used our big cooler since we got a monstrous turkey) mix half a gallon of hot tap water, 2/3 cup sugar, and a pound of salt. (different slats weigh different amounts so it's important to weigh it here) Stir thoroughly to dissolve the crystals. Then throw in about 8 pounds of ice and enough additional water to be able to cover the turkey (About 16 cups). 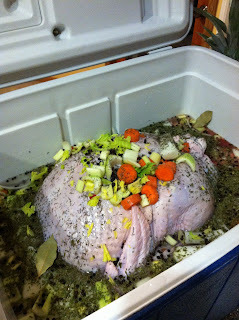 Place the turkey in the brine with the breast side up. Make sure it can be totally covered and weigh it down if necessary. Let it rest for 8 to 12 hours in a cool place. I usually let it sit out in the garage since it's already cold this time of year here. For safety reasons, it is important to keep the brining liquid at 40°F or right below. You can add additional ice to keep it at around this temperature. 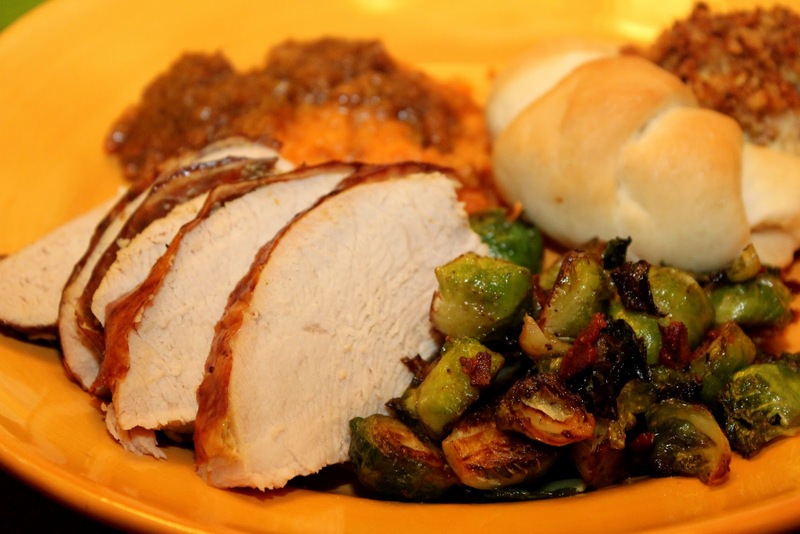 Remove the turkey from the brine, rinse thoroughly under cold water, and pat dry with paper towels. Roasted Jalapeno, Fresh Sage and Orange Butter Rub. I love the spiciness that the jalapeno's give to the meat and especially when you use the juices to make a gravy afterwards! I even added a habenero pepper this year to make sure it was really spicy. It doesn't make the meat that spicy so don't worry about it if you have those that can't handle the heat. Put orange juice in a small nonreactive saucepan and bring to a boil over high heat. Cook until reduced about 1/4 cup. Let cool to room temperature. Put the butter, cool orange syrup, zest, jalapeno and sage in a food processor and process until smooth, season with salt and pepper. Scrape into a bowl. Can be made 1 day in advance and stored, covered in the refrigerator. Bring to room temperature before using. Preheat oven to 450 degrees F. Rub the entire surface of the turkey with 3/4 of the butter. Season the skin and the cavity liberally with salt and pepper. Truss the turkey and place on rack in a large roasting pan. Melt the remaining butter and immerse a piece of cheesecloth in the mixture. Unfold and lay cheesecloth over the top of the turkey. Pour any remaining butter over the cheesecloth. Roast the turkey for 30 minutes. Check if the skin of the turkey underneath the cheesecloth is golden brown then cover breast with tinfoil. The cheesecloth may turn pretty black but should still just brown the turkey skin. Turn the temperature down to 350 degrees and continue roasting for 2-3 hours or until the internal temperature reaches 165 degrees F and the thigh registers at 180 degrees F. Do not rely on the pop up timers if your bird comes with one. It will be overdone and dry! Remove the turkey from the oven and let rest for 20 minutes before carving. I'm sold! 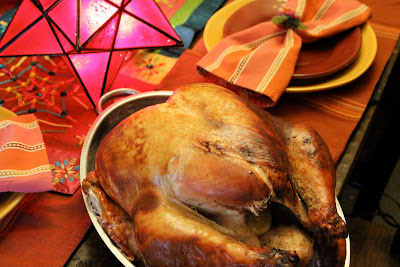 I'm brining a turkey today because I'm not hosting the big dinner and I want the leftovers. (And the turkey's been in the freezer a while and I need the space!) Ad the gravy made with some jalapeno would be great for me. Wonderful job. Wow, amazing looking turkey and a cool new way of cooking it! Great job!